Ande ka khaara seviyan or Egg vermicelli is a quick and delicious breakfast/ brunch dish that gets cooked in less than 15 minutes. It is an ideal breakfast dish when you are short of time and wish to cook something yummy. We also prepare khaara seviyan with eggs or kheema (minced meat) for Iftar during Ramadan. 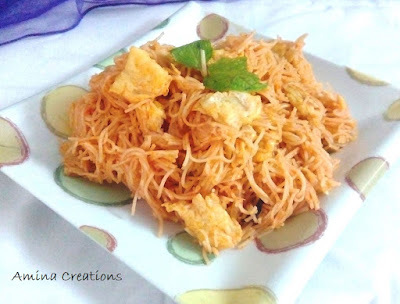 You can also check out other recipes with vermicelli like ragi vermicelli, lemon vermicelli with eggs and Kheema seviyan/ vermicelli in this blog and check out breakfast recipes page for Breakfast menu options. Heat oil in a thick bottomed pan, add onions, cardamom and cinnamon and saute till the onions turn golden. Next add red chilli powder and salt and mix well. Continue cooking in low flame for 3 to 4 minutes till oil starts separating and the raw smell of tomato goes. Add coriander and mint leaves along with green chilli and water and bring to a boil. When water starts boiling, add vermicelli and mix well. Cook for a couple of minutes in high flame and when most water has evaporated, reduce heat and close a lid. Cook for about 5 minutes in low flame. Mix well and check if the vermicelli is cooked. If not, cook the vermicelli for a few more minutes in low flame. While the vermicelli is getting cooked, we can scramble the eggs. For this take a bowl and break open 3 eggs. Whisk well and add ½ tsp salt (or to taste). Whisk well and keep ready. Heat a non stick pan with 2 tbsp oil and add the eggs. Cook the eggs and gently break it into small pieces. (The eggs have to be nicely cooked and not raw). Add the eggs to the cooked vermicelli and mix well.